Did you all have a fabulous 4th of July? We spent our day relaxing by the beach, having dinner with friends and then watching fire works with my family. Luckily it wasn't as hot as it could have been but temperatures have been on the rise every day. Last week was once again our biggest week which shocked me since I posted it super late and it was a holiday week. My hope is that this week we can break 50 link ups? Pretty please? I know you can do it! If you have any recent bread recipe posts you can also check out the Homemade Bread Challenge blog hop and add them to that party too! As this party grows it is getting harder and harder to pick my features but I the four I picked today were not only my personal favs but also some of the posts that got the most visits from you lovely readers/participants. I love pasta salads especially during the hotter months of the year so this Summer Pasta Salad from Naptime Creations sounds perfect to me. I also love stuffed shells and I have been wanting to try ground turkey so Mal at the Chic Geek got my attention with her Stuffed Shells recipe which incorporated both. 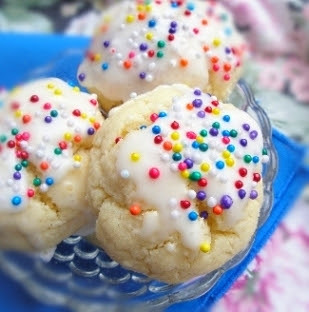 In honor of my love/obsession with all things sprinkles right now, I had to feature these precious looking Italian Cookies from Annie's Home. How cute are they? 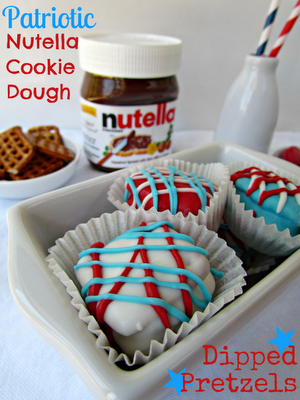 And lastly, in honor of America's recent birthday, I had to feature these tasty looking little Patriotic Nutella Cookie Dough Dipped Pretzels from Crazy for Crust. Talk about everything I love in bite sized form! Thanks so much for hosting and have a fantastic week!! Thanks for hosting and for the feature! Yay! Thanks for hosting . Have a wonderful week. This week I am sharing some sweet treats!